Online training that makes you more musical. As musicians we all dream of freely expressing ourselves in music: playing by ear, improvising, and jamming with others. But traditional music courses fail to show you how. With simple online training from Musical U, you can learn these skills… and unleash the true musicality you have inside. It’s fun, exciting, passionate, and social. Learning music… is often none of those things. Just pick up our instrument and play, freely and easily. Bring out our own music, not just play the notes we’re told to. Instinctively understand how music works when we hear it. Feel like a “natural” musician. Be fearless in music, with unshakeable confidence in any musical situation. Become the real musician we feel inside ourselves. Totally dependent on sheet music, tab or chord charts. Restricted to playing other people’s music, not knowing how to create our own. Too intimidated and scared to join a jam session or karaoke night. Frustrated at what feels like wasted effort learning technical instrument skills. Disappointed we don’t seem to have “talent”. Guilty about not becoming the musician we set out to. We still have a burning desire to become that “natural” musician, and still feel a spark of potential inside… But we just can’t seem to make it happen. Since 2009, Easy Ear Training and Musical U have helped over 1 million people to become more musical. Be confident to join jam sessions, bands and choirs. Musical U combines the very best learning resources with a flexible training system and unlimited access to expert personal help. And the results speak for themselves. It works. I grew up as “the musical one” in my class, learning to play several instruments and performing regularly with bands and orchestras. But I never felt like a “real” musician. I couldn’t freely play the music I heard or create my own music confidently. I’d listen to albums I loved and have no idea how that music was put together. It really frustrated me that the music I played seemed totally separate from the music I loved listening to. Even though I was good at playing guitar and piano, I felt really limited because I had to go out and find sheet music before I could play songs – even the songs I listened to all the time and felt like I should know inside-out! Then I discovered ear training and found that all those skills I’d desperately wanted – like playing notes and chords by ear, improvising and jamming along – were things you could learn. The ear training process was old-fashioned and boring – but it was powerful. That’s why I founded my company in 2009 – to bring ear training into the 21st century by using technology to make it fun and easy. Learning to play scales faster or memorising another song won’t give you the musical instinct you crave. To truly feel like a “natural” you need to learn the inner skills of musicality. Simple, practical exercises can bring your musical ears up to the same level as your instrument playing, and transform the way you play and experience music. Over 40 in-depth training modules which explain the fundamental concepts you need to know, teach you the core listening skills, and help you to start applying it all to real music. Need help? Unlike traditional apps and courses that leave you alone and struggling, Musical U provides unlimited access to personal help from an expert team. Ask questions and get fast replies to help you keep moving forwards. Teaching yourself music can be lonely, and we all improve faster when we can learn from each other. Being part of the Musical U community helps you get better results and enjoy the whole process more. Our members range from 16 up to 80+ years of age. It’s never too late to learn. Many members are coming to music (or returning to it) in retirement and seeing great progress and improvement. The inner skills of musicality can be applied to any and every instrument. Musical U members play piano, guitar, bass, singing, ukulele, violin, banjo, harp… the list goes on. Music is incredibly varied but fundamental musical truths and skills are universal. That means Musical U works for classical, rock, pop, dance, acoustic music and more. Musical U is compatible with all modern computers and internet devices and many training modules provide downloadable MP3s which can be used any time. You can train at home – or while walking, in the car, or waiting in line, making it easy to find the time. “I find these modules to be pedagogically sound, well-organized, and designed for the user to work at their own pace. These modules, combined with the staff and community support, are effective tools for an individualized music theory and ear training education. Joining Musical U gives you instant access to all the training materials you need to succeed. Plus, you become part of a friendly supportive community that helps ensure you stay on track, and unlimited personal help from an expert team to guarantee you overcome any hurdles you might encounter. Want a taste of what Musical U could do for you in your own musical journey? 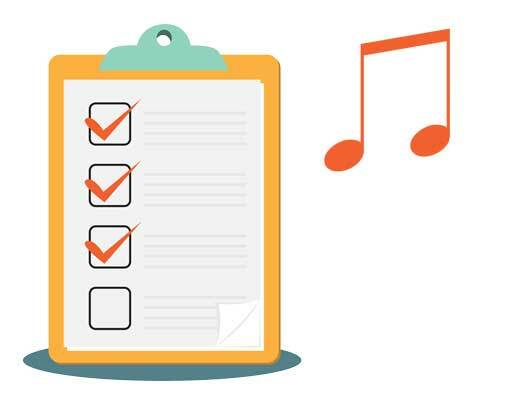 Get your free Musicality Checklist, including a personalised action plan for starting to develop the most important skills to you. - learn how to make sure you will always be “in tune”. - discover the building blocks of melodies and chords. - train in the most powerful framework for relative pitch. - identify which notes are being played in tunes, entirely by ear. - distinguish between the many different types of chord when you hear them in music. - know what chords are being used in songs, just by listening. - no sheet music required! Just pick up your instrument and play. - freely create your own powerful solos and arrangements. - be certain you’re singing clearly and in tune at all times. - get a rock-solid inner metronome and hone your sense of rhythm. ... you will have a clarity and focus about becoming more musical that you've never had before and you'll be armed with a personal Training Plan for the weeks ahead. ... you will have seen concrete progress learning the skills in your Training Plan. You'll start to notice new detail in the music you hear each day, and you'll have a new understanding of the music you play on your instrument. ... the way you hear music will have transformed - notes, chords, rhythms and more will "jump out" at you from the music you hear each day. You'll have taken substantial strides forward in the expressive musical skills you set out to learn. ... you will feel your confidence and ownership of music steadily increasing, as you start to understand musical naturally and instinctively. "Perfect for what I wanted to do gain a full understanding of music in order to become a better all-round musician"
"I have discovered how easy it is to improvise!" "I can now recognize some chord progression in popular music and I listen more closely to songs on the radio. I've found this helps me be more musical as I can use it when writing new songs." Musical U is new, and still growing. We launched in 2015 and our community is still small - but this means it really feels like a community. We're tight-knit and we really care about each and every member. And although we only launched recently you can have confidence in the training we provide: Musical U is built on training material developed and proven at Easy Ear Training since 2009 which has helped hundreds of thousands of people to improve their musicality. Oh - and to make sure it doesn't feel like you're taking a risk by joining: we provide the most generous guarantee around: if you're not satisfied at any time during your membership we'll refund of your most recent payment in full. → Learn more about our "Total Confidence" Guarantee. So What Does Your Musical Future Hold? Have you been feeling too nervous to play in front of people? Or bored by your daily music practice, always the same old slog without the results you'd hoped for? Have you wondered if you're getting anywhere in music - or even considered giving up? If you feel that deep love of music, and the burning desire to be more naturally musical, we want you to join us. It doesn’t matter what stage you’re at. It doesn’t matter if you’ve tried and failed in the past. It doesn’t matter what frustrations and barriers you’ve experienced. All that matters is that you want to become more musical. It won’t happen overnight. It will take effort and determination. But when you join Musical U you’ll have access to all the very best training resources you need, and every step along the way you’ll be surrounded by a supportive community of people on the same journey, who can help you with any problems you encounter. Music feels like a chore instead of a delight. Questioning whether you're making any real progress. Considering giving up music completely. Pleased and proud of the new skills you've developed. Excited and inspired to play music every day. Confident in your abilities and ready to seize new musical opportunities. Certain that you do have everything it takes to become an amazing musician. Musical U isn’t just another lesson, book or course. For the first time, there is a full solution that ensures you actually reach your musical goals. Imagine truly understanding the music you love. Imagine being able to express your own musical ideas easily and confidently. Imagine having other people look at you and assume you were one of those “naturals”, born with a musical gift. Join us at Musical U, and become the musician you’ve always imagined. "I feel a eureka moment of understanding. I now understand the value of ear training and am equipped with the knowledge and tools to fully appreciate and analyse music." "Since becoming a member I've really gotten into rhythm, had success with melodic intervals and chord progressions and I can now quite easily pick out a tune by ear."